Brisbane artist Michael Zavros' meticulously painted miniature paintings often address societal values by depicting symbols of beauty, wealth, and status. His immaculate artworks are consciously valuable and collectable objects - the visual equivalent of their seductive subjects which range from extravagant palaces to male models, and designer clothing. 'V12 Narcissus' 2009 relates to a series of paintings Zavros made of his prized black V12 Mercedes Benz automobile. Growing up on the Gold Coast, the young artist and his father would bond over visiting local car dealerships together. For them the Mercs displayed in the window were synonymous with success; a symptom of what the artist terms as his Irish/Greek-Cypriot family's 'migrant materialism'. 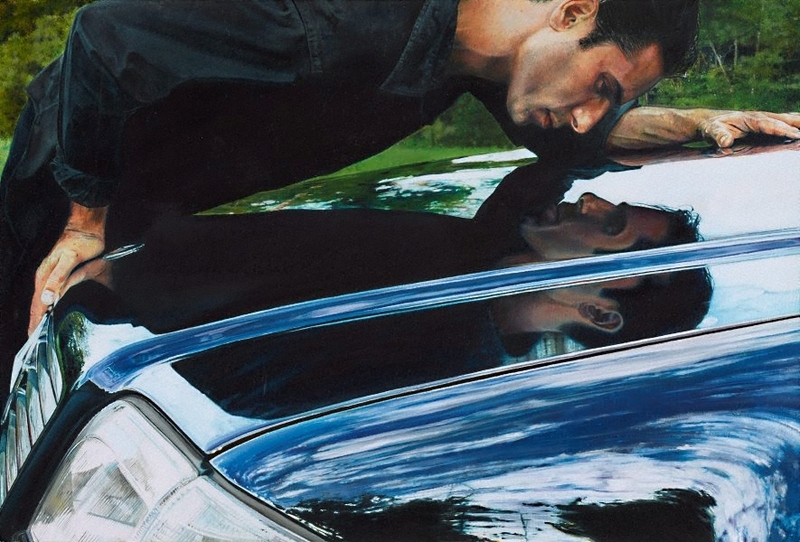 The artist casts himself as a suburban Narcissus in an image which references both polished car advertisements as well as the composition of Caravaggio's baroque interpretation of the Greek myth. However, in this contemporary adaptation the figure's face is reflected in the bonnet of his Mercedes Benz as opposed to a pool of water. "Looking at these cars and later, my drawings of them, my father and I could speak with ease and enthusiasm that extended to little else. He sought his reflection in those mirrored surfaces and I sought mine in him. And looking at the cars made me happy". Signed and dated l.r. corner verso, pen and black ink "MZ [monogram] 09". Signed and dated u.r. verso, pen and black ink "MICHAEL ZAVROS/.../ 2009/...". Katrina Strickland, The Australian Financial Review Magazine , 'Looking different every time', pg. 40-44, 26 Nov 2010, 44. David Broker; 'Michael Zavros'; 'List of works'., Flying colours , 'Paradise imperfect', Gold Coast, 2010, n.pag. (colour illus. ).